This pitcher and I have a history. The first time I saw it was after an elderly aunt asked me to feed the cats and dog, gather the eggs, and take care of the chickens while she was recuperating from a broken hip. Every morning and every afternoon for over three months I walked up the hill toward the old homestead to “do the chores,” and I would see this pitcher way up in the loft window of the barn, perched rather precariously on a huge pile of what appeared to be just junk. 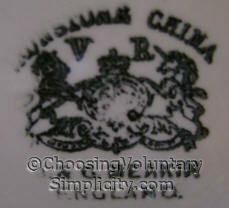 Even from that distance I could tell that the pitcher was old, and I often thought what a shame it was that it was part of my family history and it had just been thrown away. One morning my aunt told me that the barn was going to be torn down that afternoon. She had hired one of the neighbors who had a bulldozer to knock the building down. When I asked what was going to happen to the pitcher in the loft window, she told me that anything out there was worthless and would be taken to the dump. She seemed amused that I thought the pitcher was worth saving and told me I could have it if I wanted to climb into the loft, but I would have to get out there before the neighbor arrived to start his demolition. I am absolutely terrified of heights so it was a real stretch that I would even THINK of climbing up into that loft to begin with… and an indication of how strongly I felt that the pitcher deserved a rescue. Maybe it was because no one else cared what happened to it… but a few minutes later I found myself at the top of the loft ladder, scared out of my mind and almost afraid to move… and trying to figure out how I was going to make my way through all the stuff in front of me. What my aunt apparently didn’t know (and I certainly didn’t) was that there was no actual floor in the loft, and that individual pieces of boards had only been put here and there across the rafters to support the piles of junk… or that these boards would shift and move when I stepped on them. I was already partway across the expanse of loft when the board I was standing on shifted and my foot actually went down through the gaping hole. There was no way I could go back, so I continued on, crawling over corrugated roofing, broken chairs, and old milk cans. By this time I was absolutely terrified and the “floor” behind me had ceased to exist. I had, however, reached the pitcher and was sitting in a relatively stable area. I couldn’t help thinking how ironic (and stupid) it would be if I rescued the pitcher and got myself killed in the process. My ordeal actually ended quite quickly after that when I managed to find a long board on one side of the junk pile that looked sturdy. By pushing it in front of me like a bridge, I managed to crawl my way back to the ladder and safety… with the pitcher… and me… both unharmed. That means my rescued pitcher is over one hundred years old. It sits on top of a primitive-style cupboard in my kitchen, along with some older and more valuable jugs and bowls. This particular pitcher is memorable to me, though… it’s the only one I risked my life to save! What an interesting story!! That pitcher must have a special meaning to you being from your family and all. Plus you had to make an effort to retrieve it. Great post, this is why I keep coming back to your blog. Thanks! Another interesting post. I do love your blog. Oh how I love white ironstone. I own numerous pieces myself. Some are in pristine condition, others quite battered and stained. I love each and every one of them. I often sit back and wonder where each item has been. They certainly have stood the test of time. Ooooh, how lovely! What a rescue! What a memorable adventure! 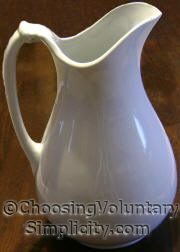 I, too, love ironstone and have a few pieces, some from Meakin, but I’ve always wanted a pitcher like yours. The design simplicity is beautiful. Neat, I just saved four ironstone bowls from a moving sale and wanted them just because I liked their look and thought they’d be nice to serve veggies in, or display fruits. I just hopped online to check it out and they’re worth 60 times what I paid! I’m keeping each and every one, I like the way they look and whoever inherits all my junk can reap the monetary reward. When my fiance and I were looking for furniture for his apartment we came across a post on craigslist for a free couch. Somehow he and his friend were able to fit the whole thing into the back of his small station wagon. After they’d gotten it home, one of our friends, who’s mother owns an antiques buisiness, came over to take a look at it. She said that judging by the type of material used in the cushions the couch could be about 80 to 100 years old. I was touched by your story; you risked life and limb to rescue a silly little nothing. I, too, am overly fond of inanimate objects, and have, on occassion, chosen them above all else. And yes, I have been struck by love at first sight, too! I thought I was the only lady on the planet who felt that way about humble objects – not objet d’art, mind you! I shall now think of you when I use my ironstone (yes, Meakin) pitcher. Kate, the only thing I can say in my defense is that I had no idea getting to the pitcher was going to be so dangerous. :o) I thought I was just fighting my fear of heights… but I’m happy to read that I’m not alone in my rescue attempts! I have this very same pitcher and keep it in a place of honor in my home. It belonged to two wonderful people who were, for lack of any of my own, grangparents to me. Their names were Bob and Marjorie and they lived in a small wheat farming community. She passed away in 1966 and he in 1971. When I was a small child they used it to water their vast collection of indoor potted plants. Thank you for sharing your story! Loved your story-and your pitcher!